| tells 115, among “the more refined professors” of that religion. In his eleventh year, he was sent “to a seminary of the like,” which, he says, was a school not only of learning, but religion. 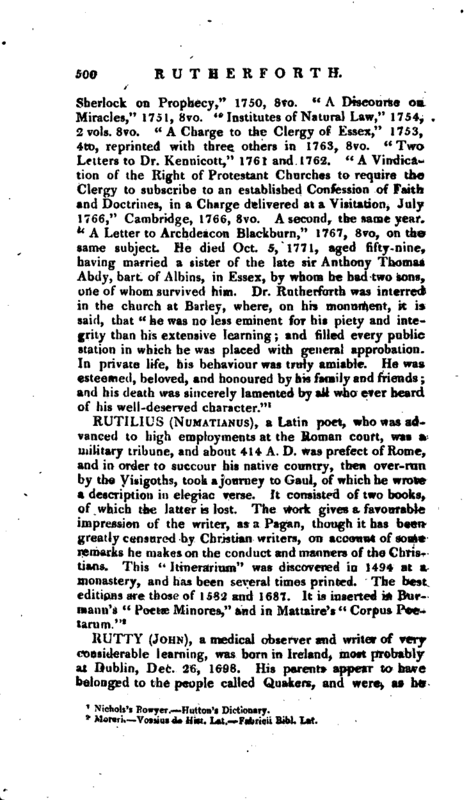 Two years after he was removed to a school where there “was far less religion,” and from this to his eighteenth year he was “at various mixed schools, and among aliens.” In his twentieth year he was again placed in a family of friends; and such were the religious impressions of his youth, that he seems at various times to have considered the acquisition of human learning as a crime. He pursued it, however, and began a course of medical studies in Ireland, which he continued in London, and finished in Holland, probably at Leyden, then the chief medical school in Europe. 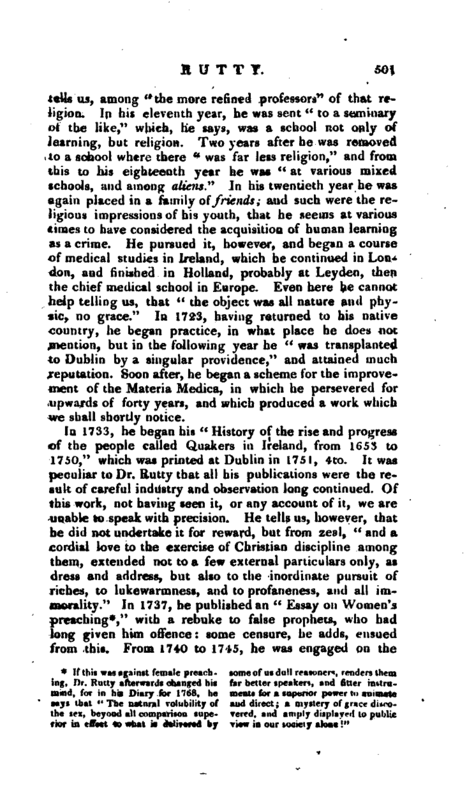 Even here he cannot help telling us, that “the object was all nature and physic, no grace.” In 1723, having returned to his native country, he began practice, in what place he does not mention, but in the following year he “was transplanted to Dublin by a singular providence,” and attained much reputation. Soon after, he began a scheme for the improvement of the Materia Medica, in which he persevered for upwards of forty years, and which produced a work which we shall shortly notice. with a rebuke to false prophets, who had long given him offence: some censure, he adds, ensued from this. From L740 to 1745, he was engaged on the | “Natural History of the county of Dublin.” This, however, was Dot published until 1772. He tells us, that now “he was led a long dance on birds, fishes, and fossils, and in compotations for information, and was greatly hurt in his spirituals by this means,” &c. In truth, these compotations appear throughout the greater part of his life, to have been an almost constant source of uneasiness, and self-condemnation. In every page of his “Spiritual Diary,” he laments over his doses of whiskey and the ill-humour they produced, although his friends assure us that, both as to temper and temperance, his conduct was rather exemplary than blameable. Yet he had acquired a habit of magnifying the least infirmities into crimes, and this pervades the whole of the volumes which he filled with his Diary. 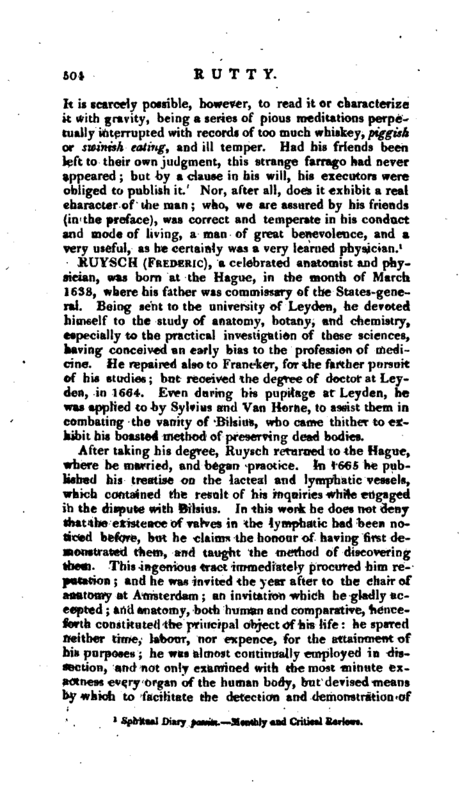 The first publication by which he was known, in his professional character, in this country, was a very elaborate work, entitled, “A Methodical Synopsis of Mineral Waters, comprehending the most celebrated Medicinal waters, both cold and hot, of Great Britain, Ireland, France, Germany, and Italy, and several other parts of the world, wherein their several impregnating minerals being previously described, and their characteristics investigated, each water is reduced to its proper genus; and besides the particular analysis, the virtues, uses, and abuses of the water are described, in a method entirely new. Interspersed with tables, tending to throw a light upon this intricate subject; and abstracts of the principal authors who have treated of mineral waters; and the accounts dispersed in the acts of most of the learned societies in Europe, are collected and properly digested,” 1756, 4to. 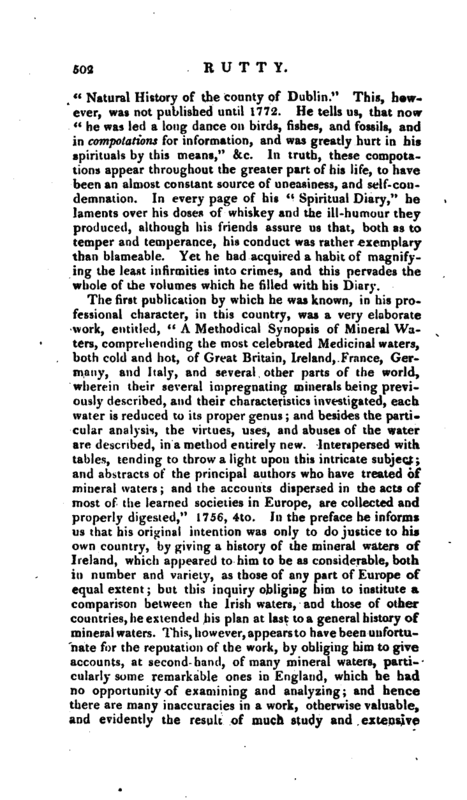 In the preface he informs us that his original intention was only to do justice to his own country, by giving a history of the mineral waters of Ireland, which appeared to him to be as considerable, both in number and variety, as those of any part of Europe of equal extent; but this inquiry obliging him to institute a comparison between the Irish waters, and those of other countries, he extended his plan at last to a general history of mineral waters. This, however, appears to have been unfortunate for the reputation of the work, by obliging him to give accounts, at second hand, of many mineral waters, particularly some remarkable ones in England, which he had no opportunity of examining and analyzing; and hence there are many inaccuracies in a work, otherwise valuable, and evidently the result of much study and extensive | inquiry. Dr. Rutty informs us that this work engaged him in a controversy for three years. With this we are unacquainted, having seen only a scurrilous pamphlet by one Lucas, an apothecary, and of some note as a mob-patriot, but which was spoken of in the literary journals of the day with the contempt which it appears to have amply deserved, and could scarcely have been worthy of Dr. Rutty’s notice. 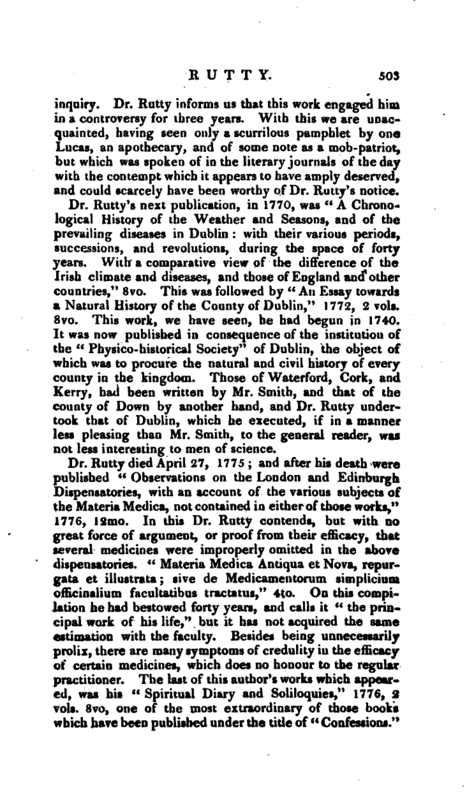 Dr. Rutty’s next publication, in 1770, was “A Chronological History of the Weather and Seasons, and of the prevailing diseases in Dublin: with their various periods, successions, and revolutions, during the space of forty years. With a comparative view of the difference of the Irish climate and diseases, and those of England and other countries,” 8vo. This was followed by “An Essay towards a Natural History of the County of Dublin,” 1772, 2 vols. 8vo. This work, we have seen, he had begun in 1740. It was now published in consequence of the institution of the “Physico- historical Society” of Dublin, the object of which was to procure the natural and civil history of every county in the kingdom. Those of Waterford, Cork, and Kerry, had been written by Mr. Smith, and that of the county of Down by another hand, and Dr. Rutty undertook that of Dublin, which he executed, if in a manner less pleasing than Mr. Smith, to the general reader, was not less interesting to men of science. 1 Spiritiwl Diary passim. Monthly and Critical Reviews.